Availability: In Stock! Place your order now directly from the manufacturer Right NOW in the U.S.A. PRO Boxing Equipment™ is the Original Manufacture of the PRO Submission Grappling Dummy™. 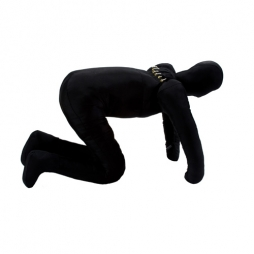 We make the top of the line grappling dummies for gyms, retailers, and distributors all over the world! The most realistic, superior grapple dummies in the world. Others try to duplicate us, but imitations are nothing compared to the PRO Submission Grappling Dummy™. With PRO Boxing Equipment™ workmanship and quadruple stitching along all stress seams, the PRO Submission Grappling Dummy™ is the most innovative, genuine piece of equipment you could ever want! Maximize your training to the next level, without any of hesitation that you would have on a spar mate. 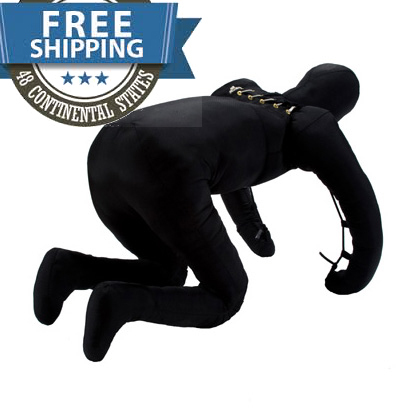 The PRO Submission Grappling Dummy™ is made of 1000 Denier Cordura, an extremely strong, rip-stop material that is impossible to tear through with normal usage. The limbs have 'life-like' resistance for arm and leg lock training. Manufactured entirely in the USA, hand inspected and guaranteed against defective materials. Approx. dimensions: 6 feet tall / 75 lbs. The Dummy: I have used this dummy for a week now, and I have noticed my game is sharper and faster for drilling right and left sides. So far mostly every technique I apply on my rolling partners I can apply on this dummy comfortably. I can see myself using this guy every day, awesome product PBE! Usage: I would recommend a rashgaurd/GI for this dummy and GI pants. I would also suggest a minimum of a 10X10 space or a mat to maximize drilling with this dummy. Amazing product. Super well made! Extremely helpful for working positions at home. Ali took my order and went to work immediately. I would recommend this product to anybody. It is a must have if you train. I ordered this dummy as a birthday present and am very impressed with the workmanship. Ali was very helpful in answering all my questions in regards to purchase. I just received my proman grappling dummy and spent two hours rolling around, joint locking, doing arm bars, chokes, etc. The product shipped in less than 24 hours after I ordered it, it is HEFTY, weighs 75 pounds, very solidly constructed, a great product, very realistic related to what the BJJ practitioner needs to have a 24 hour training partner who won't complain when you crank on his arm 50 times in a row!!!! I LOVE THIS THING!!!!!! My grappling dummy has lived up to everything positive that I have read about. This guy is in perfect position to work the ground game. I will work submissions, drills, and transitions over and over. It is unbelievable. This dummy also will fall into place naturally in some instances. I am really happy with it and definately recommend the dummy. I am 6'3", 230lbs. With that said, I have my 4 yr. old doing drills and working with this thing. My two boys love the dummy. They walk by it and kick him and punch him all the time. Reversible Interlocking Puzzle Gym Mats, 1"
Reversible Interlocking Puzzle Gym Mats, 2"